Native Earth Performing Arts continues its 2016-17 season of compelling Indigenous theatre with Sheldon Elter’s Métis Mutt, directed by Ron Jenkins, at Native Earth’s home in the Aki Studio. Métis Mutt began as an eight-minute piece at NextFest 2001, inspired by teacher Ken Brown and the vocal masque style of solo show. Since then, it’s grown into a 90-minute feature, was a hit at Edmonton Fringe, subsequently adapted for high school audiences, and has toured Canada and New Zealand. The Native Earth production marks the show’s Toronto premiere. A semi-autobiographical piece of storytelling that combines stand-up, music, monologue and multiple character vignettes, Métis Mutt is part memoir, part spirit journey. Searching for his authentic voice, a young Métis (have Indigenous, half white) man struggles with centuries-old cultural stereotypes and internalized racism as he finds his way out of a cycle of violence and self-destruction to healing and forgiveness. Heartbreaking flashbacks to the young man’s childhood reveal a sweet boy torn between protecting his mother and younger brother, and running and hiding from his father’s drunken outbursts. A favourite of his father and thus escaping the beatings, he beats himself up for his failure to act and for being a coward. Later on, having moved away with his mother and brother, his conflicting feelings emerge in letters to his dad—love and fear, longing and confusion. As a young man, he discovers a talent for stand-up and music, and finds chosen family on the road with his hypnotist performer friend Mark, and is later drawn to theatre school. And when years-old buried emotions erupt to the surface, he self-medicates with drugs and alcohol, and cuts himself, to numb the pain. His thoughts turn often to his father, a troubled man who struggled with demons of his own only to find them emerging from the bottom of a bottle to turn on his family. And the death of his father becomes a turning point. Not wanting to go down that same road, the young man finds his way back to himself, finding self-awareness in his struggle for identity and self-acceptance, and forgiveness for his father. An engaging and versatile performer, Elter deftly shifts from comedy to tragedy throughout—a hilarious and stark reminder that pain comes from laughter and laughter comes from pain. Setting the tone off the top of the show with a set of stand-up, what starts off as a good-natured, self-deprecating series of stereotypical riffs on “Indians” becomes a biting commentary on hundreds of years of oppression and racism as joking around turns to rage, and entertainment becomes condemnation. The pain is turned inside out so others can see and understand. The title Métis Mutt is both a source of laughter and pain, poking fun at identity even as it grieves the damage of racist name-calling. From cheeky stand-up and bawdy music bits, to poignant characterizations and startling scenes of violence, Elter’s storytelling is genuine, thought-provoking and frank—finding the light and the dark spots, and ultimately unearthing hope and redemption. With shouts to the design team: Tessa Stamp (set and lights; she’s also the production’s stage manager), T. Erin Gruber (projection) and Aaron Macri (sound). Design elements are particularly effective during the young man’s mystic healing experience, when he’s taken to a native healer after traditional medicine doesn’t help him. The semi-circle of stones that delineates the playing space, and the semi-circular dream catcher backdrop that serves as a projection screen, create a sacred space that both honours and evokes the young man’s Indigenous heritage. Fathers and sons on a journey of growth and forgiveness in the entertaining, deeply moving Métis Mutt. Get yourself out to the Aki Studio to see Métis Mutt, running to February 5; get your ticket info and online tix here. Factory Theatre joins forces with fu-GEN Asian Canadian Theatre Company to open Factory’s 2016-17 season of diverse voices speaking to the Canadian experience with David Yee’s acquiesce in the Factory Theatre Mainspace, directed by Factory Theatre A.D. Nina Lee Aquino. Writer Sin Hwang (David Yee) struggles with moving beyond the success of his first novel and a troubled past with his estranged father Tien Wei (John Ng). Learning from his ex-girlfriend Nine (Rosie Simon) that his father has died, he finds himself being summoned to Hong Kong for the funeral by his cousin Kai (Richard Lee), who is acting as Tien Wei’s executor. Half Chinese, and with little knowledge of Chinese cultural tradition, and not able to speak or understand Cantonese, Sin soon finds himself adrift in culture shock as he learns from Kai that he has duties to perform as the eldest son. From there, Sin embarks on a reluctant journey of family, roots and spirituality as he navigates the traditional burial rites, as well as moments of memory, hallucinatory visions and symbolism that feature conversations with a ribald Paddington Bear, a hilariously insightful monk and his ex. Lovely performances from the cast, with Ng and Simon playing multiple characters. Yee does a wonderful job mining Sin’s flippancy and arrogance for the repressed pain that lies beneath; with scars that go far beyond skin deep, Sin tries not to care but finds that he must – not just for his own sake, but for his father. As Sin’s cousin Kai, Lee brings a great combination of terse fastidiousness and tender care aesthetic; a stickler for propriety and rules, and with a dry humour that takes some getting used to, he has his own familial bitterness to deal with. We don’t see much of Sin’s father Tien Wei, but Ng gives us a solid glimpse into a man who has his own demons to battle; a harsh, gruff and dark-humoured man, his last Will and Testament is his way of reaching out to his son across years of pain and separation. And Ng is a comedic delight in his quirkier, fun roles as Sin’s airplane seatmate and the frank, pithy, jokester monk. Simon’s Nine is quick-witted and frank; a lovely, supportive girlfriend but no doormat to Sin, she tells it like it is and will only take so much of his self-absorption. Simon brings the comedy as the stern librarian and the overly cheerful funeral home attendant. With shouts to Robin Fisher’s set and Michelle Ramsay’s lighting design; austere and monolithic, the set features some cool, practical sliding drawer furniture pieces, the lighting adding to the otherworldly atmosphere as it highlights the scenes. And to Michelle Bensimon’s beautifully haunting, evocative composition and sound design. Sin of the father in the deeply moving, spiritual, revelatory acquiesce. acquiesce continues in the Factory Theatre Mainspace until Nov 27; advance tix and ticket info available online. You can keep up with Factory Theatre on Twitter and Facebook; and with fu-GEN on their Twitter and Facebook pages. Yell Rebel opened its production of Eva Barrie’s Agency, directed by Megan Watson, in The Theatre Centre Incubator space last Thursday; I caught the show last night. Searching for answers about the fate of her father Peter (Ben Sanders), Hannah (Eva Barrie) arrives at a Berlin travel agency looking for Thomas (Earl Pastko). Armed with conflicting reports and evidence, and only vague memories, Hannah is determined to find the truth. Convinced that her father may still be alive, the man Hannah seeks answers from was her father’s friend and co-worker – and also a Stasi informant. A story woven across time, through the fall of the Berlin Wall and the historical reunification of Berlin, Agency shows us a world of greys – where nothing is as simple as it appears to be, and where good intentions can come to haunt and hurt. Shifting across time and space, Agency plays out in intimate two-handers: mainly between Hannah and Thomas in the present, and Thomas and Peter in the past; in some cases, overlapping on the playing space as Thomas recalls a conversation with Peter as he speaks with Hannah. Lovely, strong work from the cast here. Pastko’s Thomas acts as the bridge between past and present; unflinchingly calm and introverted, there is a kind sweetness beneath that gruff, old-school exterior. An adept spy, he’s struggled to find a way to use his covert talents for good. Barrie’s Hannah is all youthful, haunted energy; fragile and uncertain for all her bravado and research, she longs for the truth and gets more than she bargained for. And Sanders gives us an optimistic, charming and extroverted Peter; acting on instinct and hoping for the best, Peter’s sense of hopefulness and love is put to the test. In his or her own way each is seeking reconciliation and redemption through these revelations. And, like the birds that repeatedly fly into the agency office windows, they’re butting up against the invisible walls that keep them apart. Past and present collide as the walls come down in the compelling, intimate Agency. Agency continues in The Theatre Centre Incubator until Nov 20; get your tix in advance online. Please note the early start times: 7 p.m. for evening performances and 1 p.m. for matinées. Keep up with Yell Rebel on Twitter and Facebook. How can we move on if we can’t accept the impossible? Brown paper, like fallen leaves, strewn across the floor – a struggling landscape. Two shrouded bodies, still, unbreathing – the dead. This is the sight on the playing area as you enter the Theatre Centre Incubator space – the stage set for the premiere of Colleen Wagner’s The Living, directed by Ines Buchli for the living project in this SummerWorks run. The play is dedicated to the women and girls of Rwanda who Wagner met during her travels in Africa – and who asked her to be their storyteller. To tell of what happened after the genocide. The rebuilding. The caring for orphans. The system of transformative justice whereby “perpetrator” becomes part of the “victim’s” life in a new, positive relationship dynamic – healing, reconciling. And maybe even finding redemption and forgiveness. Jacqui (Miriam Fernandes) and Henry (Kaleb Alexander) have known each other since they were children, and their memories of their times together take a brutal turn when, on opposite sides of the genocide, Henry becomes a “perpetrator” and Jacqui becomes a “victim.” Henry saves her from the killers only to become part of the rabid mob that kills Jacqui’s father and brother, and one man – a neighbour – rapes her mother (Anita La Selva), leaving her infected with HIV. But then something impossible happens. Henry and Jacqui fall in love. The community is in a brittle, fragile state as formerly imprisoned men return home, some still harbouring anger and hate, simmering in their perceptions of the wrong-doing and culpability of the people they sought to exterminate. Three spirits– murdered teenage sisters – emerge on the scene. Restless. Living their deaths over and over again. Played with startling intensity by Beryl Bain, Gabrielle Graham and Stephanie Jung; like the Furies, they haunt, taunt, whisper and hiss for the truth. Lovely work from this ensemble. Fernandes (luminous in her positive demeanour and fearlessness as Jacqui) and Alexander (repentant and sheepish as Henry, pushing beyond his deep sense of shame towards love) have beautiful chemistry, their conversations taking on a lyrical, poetic tone; two young people struggling to rebuild their lives after the horrors – striving, but hopeful to live in peace. La Selva is heartbreaking as Jacqui’s mother; sick and broken, waiting for death and afraid of facing it alone. As their neighbour Leopold, Wayne Ward brings a complexity of character; bitter and unrepentant after serving his time in prison, he hides with his fear at the bottom of a bottle, leaving his wife with the burden of being the household breadwinner. Cindy Block gives a poignant performance as his wife, a woman once abandoned by her husband’s violence and now abandoned by his hatred of the world, desperately trying to make ends meet as she lives in denial of her own horrid memories and suspicions. Françoise Balthazar is marvelous and strong as the local barkeep, now running the business alone as her husband continues serving time in jail. Tough-talking and suffering no fools, she is hurt and lonely – and, like her neighbour, feeling the guilt and shame of not speaking up during the rampage to try and stop it. Richard Lee does a nice job with the layers of the town preacher, a man who has chosen a life of religious service as his path to redemption. His words of love and forgiveness are not entirely selfless, though – including his interest in Jacqui, which while somewhat comical, has a dark edge to it. And the multicultural casting has the effect of placing this story beyond the borders of any one country, any single ethnicity. The atrocities and the aftermath could happen anywhere. With shouts to Shawn Kerwin (set and costume design) and Erika Batdorf (movement). 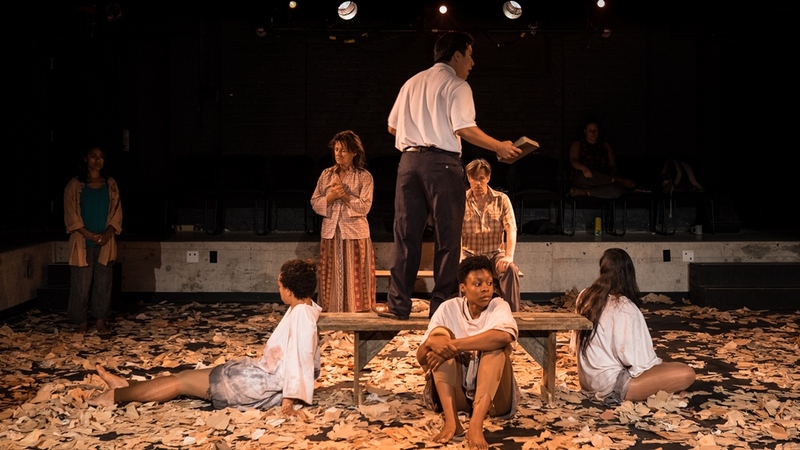 The painful truth on the road to reconciliation in Colleen Wagner’s beautiful and compelling premiere of The Living. The Living continues at the Theatre Centre Incubator until Aug 16 – check here for the detailed schedule.